Of course, I would say "fairy tales" instead of "fables" or more appropriately "folk tales" but that sounds less romantic for a list like this. Anyway, thanks to everyone who creates and reads and shares the tales. 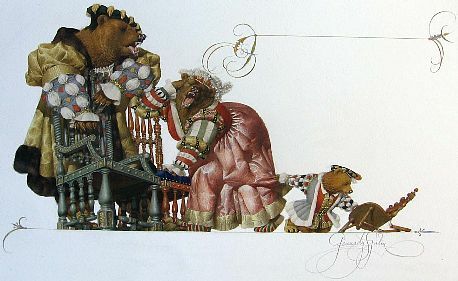 Goldilocks and the Three Bears by Gennady Spirin is a bargain priced hardcover picture book. Usually $17.99, it is currently $5.00 on Amazon. I didn't have this one myself, only Spirin's The Tale of The Firebird , which is gorgeous. March and thus Women's History Month is almost over and I failed to highlight the many older posts I have to celebrate Women, Folklore, and History. One of the draws of folklore for me has been its appeal to both genders. 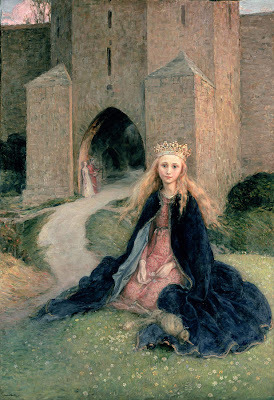 These days fairy tales are often stereotyped into either facile children's literature or escapist women's romance (or in March, underdog basketball teams). We here know that those may be facets to some interpretations of the lore, but they only scratch the surface. And over the years as I have delved more into the history of the tales from their creation to their collecting, I appreciate how much folklore has provided a voice and outlet for women, especially when they had less of one, in centuries past. 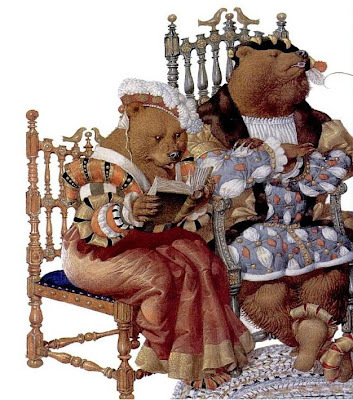 After all, one of the major and most influential periods of fairy tale history comes from the French salons where so many women wrote fairy tales of their own, coining the term "Contes de fées" or "fairy tales" for us. But even more recently, while collectors and writers like the Grimms, Jacobs and Lang dominated the field's headlines, many women are responsible for the lesser known collections, the books where I find many of the more obscure versions of tales. They were scholars and devoted to the field, building it up with more offerings and comparisons. The above book is the highly recommended Women and Tradition: A Neglected Group of Folklorists edited by Carmen Blacker and Hilda Ellis Davidson. It discusses some of those women and their contributions to the field. The traffic and readership on this blog has increased quite a bit since March 2010 so I wanted to point new readers to my Women in Folklore month of posts from that time when I shared daily posts on the subject for Women's History Month. You'll have to page through the month backward though that link but since the posts were not very chronological, but mostly freestanding, it doesn't matter much. Magic Under Glass by Jaclyn Dolamore is bargain priced at $1.59 in ebook format ($8.54 in paperback). It is not a fairy tale retelling, but has been recommended by several fairy tale fans, so I thought I would share here. Not much of a risk at $1.59 and the reader reviews are strong, too. Dolamore also wrote a novel about sirens, Between the Sea and Sky , which is perhaps what got her on many fairy tale readers' radar. The sequel, Magic Under Stone (Magic Under Glass) , was released last year and remains $9.99 for ebook and $11.55 for hardcover. For star-crossed lovers Nimira and Erris, there can be no happily ever after until Erris is freed from the clockwork form that entraps him. And so they go in search of the sorcerer Ordoria Valdana, hoping he will know how to grant Erris real life again. But Valdana has mysteriously vanished, and it's not long before Nimira decides to take matters into her own hands-and begins to study the sorcerer's spell books in secret. Yet even as she begins to understand the power and limitations of sorcery, it becomes clear that freeing Erris will mean returning him to the fairy capital. But with a new ruling family in power, Erris's return will bring danger, if not out-and-out war as factions within the faerie world are prepared to stop at nothing to prevent Erris from regaining the throne. Only Nimira, with her fledgling grasp of sorcery can help, but saving the man she loves could prove doom for the fairie world and beyond. The Witch's Curse (Christy Ottaviano Books) by Keith McGowan is the sequel to The Witch's Guide to Cooking with Children . It was released last week. The reviews for this one appear to be stronger than those for the first one, too. I admit, this one didn't interest me as much--I am rather ruined on Hansel and Gretel's witch after Donna Jo Napoli's brilliant The Magic Circle . Really, if you haven't read that one, sit down for a few hours and do so. It's short, dark, and super brilliant. I'm shocked at how much I adore that book. I eschew dark fiction beyond my fairy tale life but sometimes fairy tales deliver horror so well that my preferences are forgotten and I am engrossed. And it's published for kids although I have always been a little squeamish at its recommended age level actually depending on a child's sophistication. But then I saw this line in the Booklist review for The Witch's Curse: "McGowan here creatively interweaves aspects of Grimms’ Brother and Sister, blending classic fairy-tale and contemporary elements, magic, suspense, and vibrant, diversely drawn kid protagonists into another edgy, absorbing read." Brother and Sister! Or Little Brother and Little Sister! I don't discuss it much here, but I adore Brother and Sister. I even annotated it on SurLaLune where it is one of the least visited tales. I had to present it in my Bettelheim course in college and it was serendipitous to say the least. I wasn't as familiar with it then--although I am now--and it's been entertaining over the years to see where the tale has been blended with Hansel and Gretel so I find McGowan's concept of his sequel using the tale just brilliant. I haven't read either of his books, but this choice gets them higher on my TBR radar. A Long, Long Sleep by Anna Sheehan also qualifies for today's science fiction fairy tales list. It's also dystopian which is why I perhaps forgot to add it on my earlier list today. This one draws inspiration from Sleeping Beauty. Back in the fall, John was doodling around with some fairy tale illustrations with science fiction twists for the fun of it after we had a lengthy discussion one day about which genres have few fairy tale inspired retellings. My list of science fiction retellings was slim, I could only think of a handful. I'll do a post of those separately today. But for now I wanted to share the first three--and I don't know if there will be more since John is rather da Vinci like in his creative projects--flittering from one to another as the mood captures him. From computer illustration to painting to sculpting, he does it all and goes where his muses lead him at times. There are others in draft, but these are the completed ones. But we can hope since we have a really adorable version of seven dwarf robots in draft. 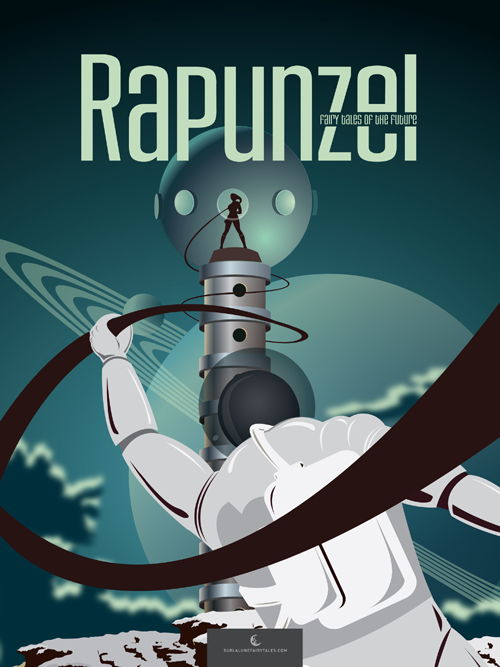 John wanted to instill the flavor of the old pulp science fiction paperback covers from the 80s and earlier, but with the modern feel of computer illustration. These make me want to write the stories to go with them, what about you? 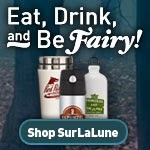 I have added these to the SurLaLune CafePress store. They are also available as posters on Zazzle where John was happier with the poster printing options. Which illustration is your favorite? This is the one we struggled with the most between John's vision and my own. She started out as Briar Rose/Sleeping Beauty with a different color scheme and a slightly different backstory in our minds. 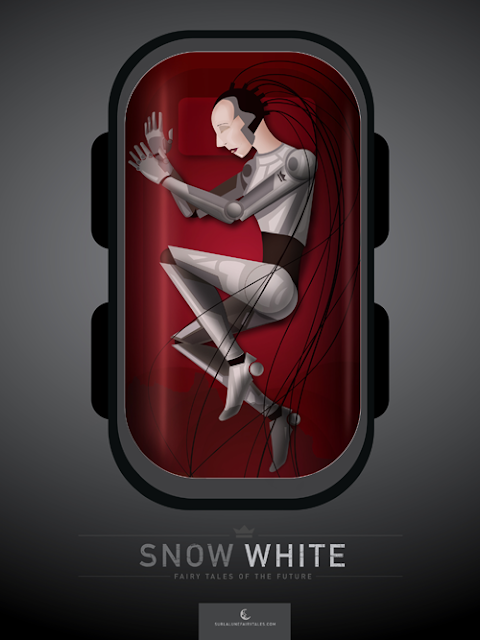 But the glass coffin is obviously Snow White and once I showed John some classic illustrations such as here and here, he agreed, changed the color scheme, and Snow White entered the stasis chamber. At first she was riding away, but then we turned LRRH back, riding directly into danger in the forest. Much better, yes? 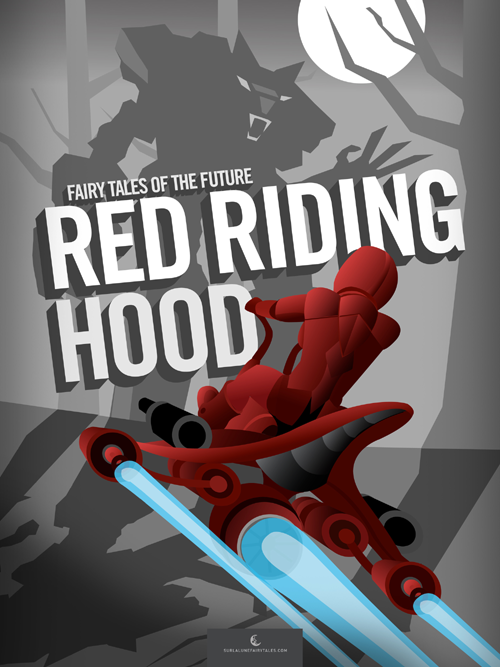 I mentioned in my earlier post today that I would write a post about science fiction genre retellings of fairy tales. And it's a short post. I'm sure I have to be missing a few, but here is my short list. I am an admitted science fiction fan, although I am also picky and tend to lean towards space opera more than "pure" science fiction. "Beauty" by Tanith Lee, which appears in Red as Blood or Tales from the Sisters Grimmer , is my favorite science fiction retelling of a fairy tale. It is also one of my favorite Beauty and the Beast retellings, period. A must read for Beauty and the Beast fans. Once Upon a Galaxy is a short story collection of science fiction retellings, some more successful than others. It is out of print, unfortunately. ...in these original new stories by today's masters of science fiction and fantasy. Two time-tested genres test the limits of "happily ever after" when beloved tales like "Goldilocks" and "Sleeping Beauty" are given an outer-space spin. Once Upon a Galaxy edited by Josepha Sherman isn't really a collection of science fiction retellings, but it offers tales as inspiration for well-known science fiction. Science fiction is all around us. Fantasy fiction is just as well known in today's world of entertainment. But what few readers of science fiction and fantasy realize is that these stories of wizards and star ships have much older roots in the world of folklore. Cultures throughout the world share common references to heroes who must fulfill great quests featuring wise old men, magic potions that can save a life or clever adventurers who outwit their foolish enemies. This book has collected the original stories that served as the inspiration behind Star Trek, Superman, Star Wars, and even Bugs Bunny. Cinder (The Lunar Chronicles) and Scarlet (The Lunar Chronicles) by Marissa Mayer were perhaps the first titles you thought of, since they are the most recent and ongoing science fiction retellings of fairy tales. The next two are inspired by Jack and the Beanstalk. Both are out of print. Behind every folktale there is a true story and behind every legend a lost fact of history, distorted by word of mouth of people who did not understand what was really happening. In the case of the infiltration of the highly strategic space station upon which the battle between the Salviar Federation and the Hilax Combine pivoted, the account of Earth's role in the affair has become greatly distorted. Because that was eight hundred years ago and the men of Olde England never even knew the world was round, let alone that it was a planet. Earth still doesn't know which side we were on and because we are out on a far limb of Galactic Sector Seven they haven't contacted us yet. But our very position in the Milky Way just that once made our little planet strategic - and when Salviar's scout Jasar-am-Bax had to enlist the aid of a clever young yeoman to launch his kamikaze attack the result became legend. But it took John Rackham to uncover the real story behind the event. It's all in BEANSTALK - it just depends on how you look at it. Finally, The Quantum Rose (Saga of the Skolian Empire) by Catherine Asaro is often described as a science fiction Beauty and the Beast. Having read it, it fits quite well. Part of her Skolian series, the initial premise has the heroine marrying an alien, a beast to save her people. It has some rough themes of abuse and worse, so be reader beware. That said, I enjoyed it enough to read more of the Skolian series which has an interesting use of science in several of the books, but can be enjoyed as space opera, too. Asaro plays with genres with her usage of science fiction, romance and fantasy along with well-developed characters throughout the series.